Houston, TX - The Texas Stars (11-13-0-1, 21 points) were defeated by the Houston Aeros (16-4-2-6, 40 points) 4-1 in front of 10,240 fans at the Toyota Center on Friday night. Goalie Matt Hackett (10-3-3) stopped 29 of 30 Texas shots, including 16 in the second period, pushing Houston past Texas. Aeros Joel Broda, Matt Kassian, Chay Genoway and Chad Rau each scored, as Houston improved to 4-0-2-0 against Texas this season. 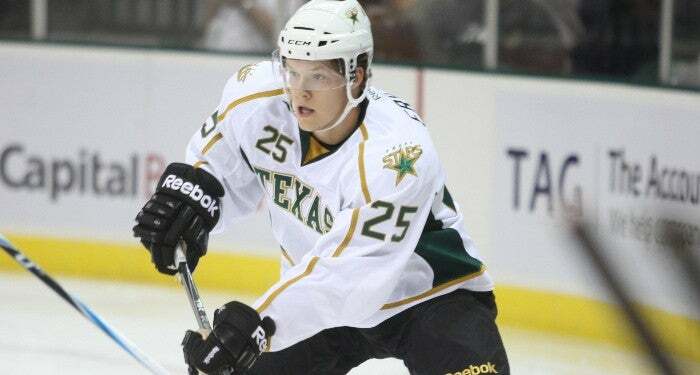 Rookie Matt Fraser extended his scoring streak five games with the lone Texas goal. Stars goalie Tyler Beskorowany (4-7-0) suffered the loss with 28 saves, as Texas fell to 7-6-0-0 on the road this season. The Stars return home to host the Rochester Americans at 7:00 p.m. on Saturday night. Houston opened the scoring with the only power play of the first period. Aeros defenseman Chay Genoway found a loose puck to the right of the Texas goal. Genoway slipped the puck past a sprawling Tyler Beskorowany for his second goal of the season. Houston forwards Kris Foucault and Jed Ortmeyer each had an assist, as the Aeros claimed a 1-0 lead. The Aeros opened the second period with two goals in the first 4:13 of play. Left wing Matt Kassian extended the Houston lead to 2-0 just 1:29 into the middle frame. Kassian fired the puck from the left wing circle, beating Beskorowany for his second goal of the season. Aeros forward Joel Broda made it 3-0 just 2:44 later. Houston’s Justin Fontaine snapped a pass to the Texas slot and Broda finished off the play for his fifth goal of the year and a 3-0 Aeros lead. Texas got on the board at 11:49 of the second period, rookie Matt Fraser netted a power-play goal to pull the Stars within two goals at 3-1. Right wing Raymond Sawada and center Travis Morin each had an assist on Fraser’s 13th goal of the year. Aeros forward Chad Rau netted an unassisted goal at 6:59 of the third period for the 4-1 final score. Texas returns home on Saturday, December 17th at 7:00 p.m. to take on the Rochester Americans. The first 3,500 fans to the game will receive a Texas Stars fleece blanket courtesy of H-E-B. Saturday also features the State Farm Family Four Pack, consisting of four tickets, four hot dogs and four sodas for $48. Texas rounds out its weekend with a 3:30 p.m. game in San Antonio.